Harry Potter is the most successful film series in history1. With its conclusion it is sure to be usurped by former leader1 James Bond. In this Daniel Craig incarnation or the next Bond is always only a number of films away from dominance. James Bond is the epitome of film franchise; the character has been played by a variety of actors the majority of whom have been accepted by the public; each film is a self contained storyline with no reference to prior movies; it has been successfully rebooted numerous times2; there have been 18 movies3; it is 50 years old. It is the Hollywood business plan. 2 James Bond reboots occur every time a new actor first plays the role; there have been six occasions4. A counter argument is reboots occur after a hiatus – in which case there have been two4. Before a series comes the (first) sequel. This is the acid test that determines the direction of subsequent entries. Sequels tend to take one of three routes: the thematic swerve (Aliens 1986): the narrative continuum (Halloween 2 1981): the carbon copy (Friday the 13th Part 2 1981). Final Destination 2 2003 chose the path of least resistance aka the James Bond effect. The revelation in Final Destination 2000 is Devon Sawa. Though the film’s high concept is preposterous Sawa’s performance anchors the film into a suspension of disbelief. His character survived the movie – along with two others – but died before the sequel. The reason Tuesday Night features in A Nightmare on Elm Street 4: The Dream Master 1988 is because Patricia Arquette wasn’t available to reprise her role. In the documentary Never Sleep Again 2010 actor Rodney Eastman alleges Arquette wasn’t hired due to New Line’s unwillingness to pay her asking price. As Eastman notes The Dream Master suffers for it. Whatever the reason for Sawa’s absence4 Final Destination 2 suffers for it. In his stead is one AJ Cook. On the surface swapping a boy for a Final Girl is astute casting. Onscreen it is failure. Final Destination 2, like its predecessor, is an action film. Women cannot and do not carry action pictures5. 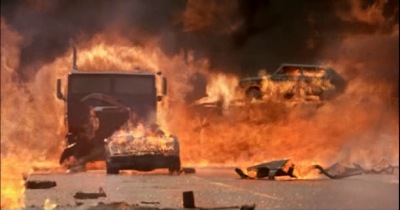 The exception (Terminator 2 1991) is not the rule. 5 Female action heroes exist in the fantasy (and/or politically correct) subgenre of action6. Any credible female lead in a reality milieu is the exception7. AJ Cook8 should be a synonym for insipid. The woman is out of her depth and range. Her talent belongs on daytime television as background noise while the stay-at-home-moms and deadbeats vacuum the front room. Her one-tone performance renders Final Destination 2 without centre so much so that it is not a prediction she will never carry a movie again. The template for horror casting is young, inexperienced and cheap actors supported by older, talented and cheap has-beens (Halloween 1978). Final Destination adhered to this convention. Final Destination 2 did not. Co-star Michael Landes plays the older voice and love interest. He’s barely older than Cook. He’s barely better. Returning to the cast are Clear Rivers and Tony Todd. Rivers was bad in the original and she’s no better here. Worse still her character does not belong in this movie: there is insufficient motivation for her actions. Tony Todd’s reprisal as seer is both homage to his iconic status and insult to his racial identity. The mortician he plays is no more than ‘mammy’ – and is treated worse than she was by these whites. One of the changes from the previous movie was to insert the lead character into a pool of strangers as opposed to a group of friends. It’s another creative blunder. In Final Destination tension exudes from the fear of which friend is going to die next. In this sequel who should care which stranger dies next? There is no camaraderie, there is no community ergo there is lack of empathy. With no characters to speak of – and no coherence in the story – there is only plot. This manifests itself in set pieces linked by dialogue leased from daytime sitcoms. The set pieces are signposted thus the element of surprise is nonexistent. What remains is spectacle. What is missing is shock. At least James Bond has story. The opening scene of Final Destination 2 has a prologue reminiscent of the Psycho 1963 epilogue. It is an exposition scene that explains the concept of the series in metaphysical terms. It is interesting in that the movie could have taken a turn into Unbreakable 2000 territory. Alas Final Destination 2 ambitions were to be a rerun of part one. A rerun without the original writers and without the original star exposes Hollywood’s final destination. It is the James Bond effect. To get a Hollywood gig. To take the money and run. The Hougly Film and Beer Journal.